This is not a "product." Premature and low birth weight babies face challenges that full term babies don't. And the unique characteristics of human breast milk tend to meet those challenges almost completely. For instance, preterm babies need different nutrition than full term babies - and human breast milk contains nutrients that no synthetically derived product can offer. HDM Plus™ is handled in a unique way, which preserves a uniform calorie count - a minimum of 20 calories per ounce - and helps your baby grow up strong. Premature infants are also more susceptible to medical complications, so they need the antibodies that are found in human breast milk. And since their digestive systems are still underdeveloped, HDM Plus™ is free of any synthetic additives or fortifiers. A recent study published by the American Academy of Pediatrics underscores the importance of human donated milk and the essentials of safety procedures. Almost as impressive as what doesn't go in! Who is Ni-Q, and what is its mission? Ni-Q is an Oregon-based company that is dedicated to delivering the best possible nutrition to at-risk infants. We deal with hospitals, neonatal intensive care units (NICUs,) pediatric clinics and other health facilities whose focus is primarily premature and low-birth-weight infants. For many of these infants, the best possible nutrition is mom’s breast milk. But in many situations, that milk is unavailable, either because the mom is unwell or unable to provide it. Ni-Q is one of many solutions available to hospitals, but we think it’s the most healthy solution for at-risk infants, because it is the next best alternative to mom. HDM is a general term for “human donated milk.” But HDM Plus™ is the brand name of the milk Ni-Q provides to hospitals and clinics. Why is there a need for donated milk? What’s wrong with giving babies formula? The primary reason for urging the use of human donated milk is centered around nutritional value. Human milk is easier for a premature baby to digest and contains essential fats that are crucial to the development of the baby’s brain and neurologic tissues. Formula is generally a processed (and sometimes fortified) form of cow’s milk. Many premature and low-birth-weight infants, whose digestive systems may not be fully formed, have a difficult time processing the proteins in cow’s milk, and may develop intestinal infections as a result. How is HDM Plus™ different? There are many alternatives for providing human donated milk, and people have been seeking out human milk alternatives for decades. HDM Plus™ is considerate of the purity of mom’s milk, and seeks to deliver the closest - and most healthy - alternative to breastfeeding. So our FDA-approved handling protocols seek to minimize the breakdown of nutritional content. Using a proprietary process with no synthetic additives, HDM Plus™ is able to deliver more calories and nutrients in every ounce than most other human milk options. Please – when seeking human donated milk options, be careful and be vigilant. Many milk “banks” and milk “communities” do not perform the rigorous safety tests that you should demand when seeking a natural alternative. 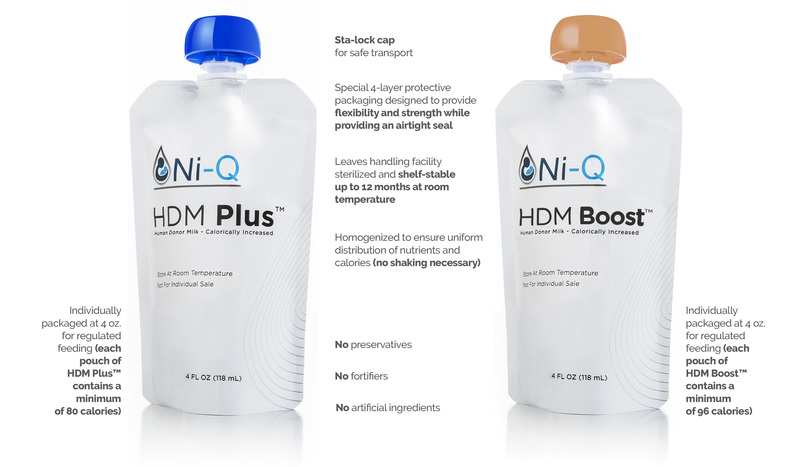 Ni-Q’s HDM Plus™ is overseen by the FDA, is triple-screened from donors and tested again for nutrient content before delivery. Always look to provide a safe and healthy option for babies who are already at risk due to their premature delivery or low birth weight. How do I know Ni-Q’s HDM Plus™ is safe? Ni-Q prides itself on providing only the safest HDM. We go to great lengths to ensure that the donor is qualified by testing our donors’ blood and milk. After the milk is received, Ni-Q painstakingly screens all donated milk for drugs and alcohol as well as pathogens and other dangerous microbial elements. Once tested and approved, the milk is then put through Ni-Q’s proprietary processing system, rendering the final solution commercially sterile while retaining key nutrients. Our milk is provided by screened, tested, and healthy donors from all 50 states in the United States. Many nursing moms produce milk at a very rapid pace, and sometimes it’s too much for their child. So we ask those moms to consider donating to us. What’s most important is that the children of those moms get the milk they need first, but if there’s extra, it’s a wonderful act of kindness and compassion to donate additional milk – and all its nutrient rich benefits – to those in need. Unfortunately, we do not currently accept donors from outside of the U.S.
Who receives the donated milk? Ni-Q HDM Plus™ is available for any baby in need. From hospital to home care, we seek to ensure that all at-risk infants receive the best possible nutrition to help them grow. Typically, a hospital or pediatric care center will agree to use HDM in their facility, and then Ni-Q will provide the donated milk to them on a schedule that works for their patient population. Is Ni-Q a for-profit company? Yes, Ni-Q is a for-profit company which seeks to supply hospitals with the highest quality HDM and the knowledge to use it to help care for premature and other at-risk infants. In order to provide such a high quality offering, we must conduct detailed research and clinical trials. Additionally, it is important to compensate the donors for their time and sacrifice. All of this is accomplished by our dedicated employees and donors, who share our goal of providing safe, high quality HDM to all at-risk infants.